The Australian continent is home to some of the world’s most unique, and fearsome, creatures. Among the most popular are the kangaroo, crocodile, and the koala. The latter is celebrated on the 2014 1 oz Silver Australian Koala Coin from the Perth Mint. Recognized around the globe as a cuddly creature, the koala is a native resident of the continent and is not found elsewhere in nature. 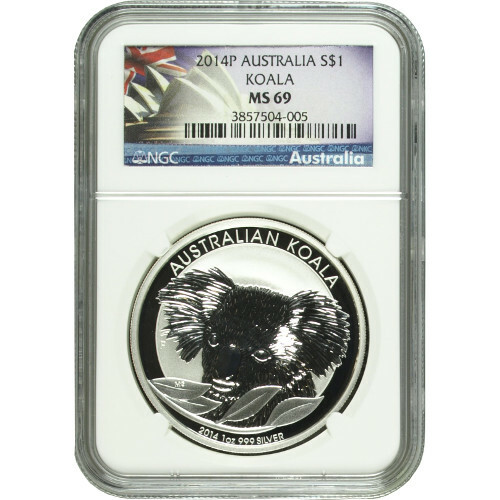 Today, you can purchase a 2014 1 oz Silver Australian Koala coin from Silver.com with an MS69 grading courtesy of the Numismatic Guaranty Corporation. There are just 4,826 coins available in this condition! 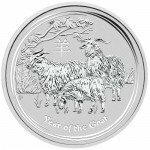 Eighth release of the Silver Australian Koala from the Perth Mint! Bears the one-time image of the koala for 2014. Considered legal tender in Australia under the Currency Act of 1965. Koalas are misunderstood by many outside of Australia. Though cuddly and docile in appearance, the creatures have sharp claws and the capacity to strike if they feel threatened. Another misconception comes from the name koala bear. The animal is in fact a marsupial, like the kangaroo. Similar to the kangaroo, the koala is a vegetarian and carries its young, known as joeys, in a pouch for the first six months of life. On the reverse side of the 2014 1 oz Silver Australian Koala coin is the image of the marsupial’s head. The intricate details of the design make it possible to identify the individual tufts of fur on the koala’s head. A strand of gum leaf, one of its favorite foods, is featured in front of the koala. Engravings include “Australian Koala,” the weight, purity, metal content, and year of minting. The obverse side features the right-profile portrait of Queen Elizabeth II, as designed by Ian Rank-Broadley. Her Majesty’s image is encircled by the engravings “Elizabeth II,” “Australia,” and the face value of the coin in Australian dollars. The Perth Mint was established near the end of the 19th century as the third and final facility in the Royal Mint system. With the subsequent closures of the Sydney and Melbourne facilities, the Perth Mint stands today as Australia’s oldest operating refinery and minting facility. An MS69 grading from the NGC indicates that each of these coins has an attractive, sharp strike, and no more than two blemishes. 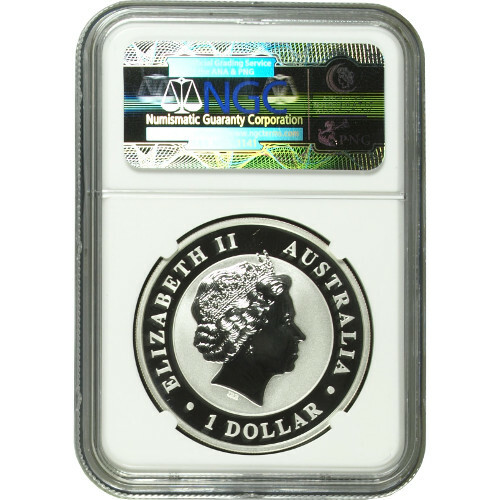 If you have questions about these Silver Australian Koala Coins or other Silver.com products, simply contact our associates at 888-989-7223. Feel free to also get in touch with us online using the live web chat located on our contact page.